(Reuters) – Trent Boult needed just 15 balls to change the complexion of the second test against Sri Lanka yesterday when the New Zealand seamer took six wickets in a devastating spell to ensure his side took complete control at Hagley Oval in Christchurch. Boult finished with career-best figures of six for 30 to help bowl out the visitors for 104, giving New Zealand a valuable 74-run first innings lead in the series decider. Jeet Raval (74) and Tom Latham (74 not out) then put on an 121-run opening partnership, while captain Kane Williamson scored 48 as the hosts took firm control of the game. Ross Taylor was unbeaten on 25 alongside Latham at the close of play on the second day with New Zealand on 231 for two and holding an overall lead of 305 runs. Sri Lanka had resumed on 88-4 with first test centurion Angelo Mathews on 27 and Roshen Silva on 15, and appeared to be comfortable as they looked to take a big chunk out of New Zealand’s modest first innings of 178. After starting play with figures of 0-20 from 10 overs, Boult then produced one of the most destructive spells in test cricket as he took six wickets for four runs in the space of 15 balls, including three victims in four deliveries. 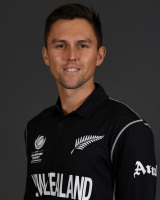 Boult, who had bowled well on the first day without much luck, had Silva (21) and Niroshan Dickwella (four) both caught at third slip by Tim Southee, who saved New Zealand’s innings on Wednesday with a swashbuckling 68, to open his account. The 29-year-old then had Dilruwan Perera and Suranga Lakmal trapped lbw on the fifth and sixth balls of his 14th over. Dushmantha Chameera, however, survived the hat-trick delivery on the first ball of Boult’s 15th over but was trapped in front on the next. 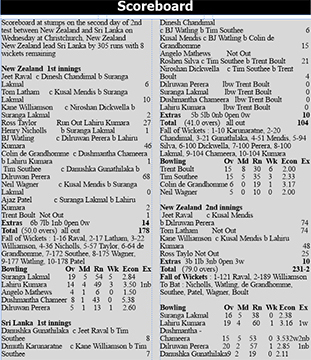 Lahiru Kumara then became the fourth successive lbw decision for a duck to the left-armer on the final delivery of the over as Sri Lanka were dismissed for 104, a measly total that left them fighting to stay in the two-match series. The first test in Wellington ended in a damp draw last week after rain washed out virtually all of the final day’s play.